Since the book I've been working on has a Mountie in it, I decided to pull down a book from my shelves, an anthology I've had for several years entitled SCARLET RIDERS: PULP FICTION TALES OF THE MOUNTIES. It's edited by Don Hutchison and published by Mosaic Press. It may still be available for all I know. 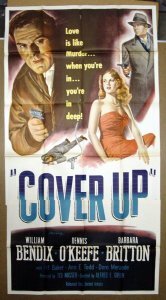 A lot of good pulp authors wrote Mountie stories at one time or another in their careers -- Ryerson Johnson, Lester Dent, Hugh Cave, Murray Leinster, even Frederick Nebel, who is much better known as a mystery author. I've read several of the stories and am enjoying the heck out of them. Currently I'm reading "Spoilers of the Lost Land" by Roger Daniels, from a 1938 issue of NORTH-WEST ROMANCES. I'd never heard of Daniels before and suspected that the name might be a pseudonym, but a check of the FictionMags Index (an invaluable on-line reference) indicates that he was a journalist and that was his real name. 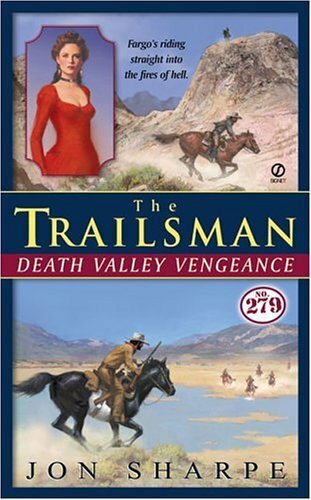 This yarn is a pretty over-the-top blending of the Mountie and Lost Race genres and is very entertaining so far. Monday I frittered away going to libraries and buying groceries, so finishing the current book had to wait until today. I wrapped it up late this afternoon, still have to do a little polishing but the hard part is done. I should get started on the next one by Thursday. After he's forced to kill the son of a wealthy rancher in self-defense, drifter Jeff Clane is wrongly convicted of murder because of the rancher's influence. After escaping from jail before he can be hanged, Clane is pursued by a bounty hunter who wounds him with a long-range rifle shot. However, Clane is taken in and nursed back to health by a family of farmers. Clane's saviors and their homesteader neighbors are being crowded out of their valley by a range-hogging cattle baron who wants the valley for himself and will stop at nothing to get it. Once Clane recovers, he is inevitably drawn into this fight, as well as having to deal with the dangers dogging his own trail. What a joy this book is to read! And I'm not saying that sarcastically. Yes, the plot is pure formula, although Whittington does go to the trouble of blending two standard plots into one. What makes it so entertaining is the rapid-fire, stripped-down prose and the noir-ish tone of the book. Whittington puts his characters through both emotional torment and physical torture. Clane doesn't heal overnight from his wound but is bothered by it throughout the entire book. Nor is he immune from the psychological effects of not only the violence he endures but also that he's forced to dish out. Like an earlier version of Ed Gorman, Whittington's Westerns are often crime stories populated by more realistic, fallible characters than are sometimes found in Westerns. SHADOW AT NOON is probably too formulaic to be considered one of Whittington's best books, but I had a wonderful time reading it anyway. Other than reading, I spent the weekend plugging away on the current book and had a productive couple of days. I should wrap up this one on Tuesday, unless I get real ambitious tomorrow. Steve asks below about the recipe for Livia's wild rice and cranberry stuffing. I checked with her, and unfortunately, there is no recipe. She just made it up as she went along. The main ingredients are wild rice, brown rice, cornbread, and dried cranberries. From there she just added spices until, in her words, "It smelled right." This is a perfect example of why cooking is an art. So, Steve, you're just going to have to experiment, I guess. I had another good day writing and am glad of that. I can sort of see the rest of this book in my head now. It usually goes faster once I get to that point. Well, it was a pretty good day. I ate too much (Livia made a wild rice and cranberry stuffing that was really, really good), wrote 22 pages, and watched the Cowboys win a football game for a change. I was disappointed in Drew Henson's outing but still thought Parcells shouldn't have pulled him for the second half. They have to find out sooner or later if he can play. Julius Jones, on the other hand, seems to have answered that question already. He had a great game and looks like the real thing at running back, something the Cowboys haven't had for a long time. (Emmitt Smith, despite his overall great career, wasn't very good his last few years in Dallas.) All in all, a fairly quiet day at home. I like that better than going somewhere there's a mob of people. Happy Thanksgiving to everyone who celebrates it. And to those who don't, I hope you have a good Thursday anyway. I plan to spend most of the day writing, as this has been a pretty unproductive week when I couldn't really afford one. But there'll be a turkey dinner to eat and some football to watch, too. I've spent the past few days writing, going through a copy-edited manuscript, doing some work around the house, and watching it rain. There was one bright spot among all that semi-gloom, however: I read Max Phillips's novel FADE TO BLONDE, published by Hard Case Crime. A lot of people I know I have already read and raved about this book, and I asked myself, Can it really be that good? The answer is an emphatic yes. It really is that good. Writing about a past era isn't all that hard. It takes some research to do it right, but it can be done. Writing in the voice of a past era is a much greater challenge, it seems to me. Simply living in the present puts a filter over our eyes and in our brains that makes it difficult not to relate the past to what's going on now. Something that's off-kilter nearly always creeps in. Sometimes it's just an anachronism, sometimes it's a bit of heavy-handed symbolism that's the author's way of saying, "This book isn't really about the past, it's about what's going on in the world now." Somehow Phillips avoids this trap and writes a book set in the Fifties that could have been written in the Fifties. I didn't see a single missed step in the plot or hear a wrong note in the writing. It's been said that FADE TO BLONDE could have been a Gold Medal novel. It certainly could have. It's easily one of the best books I've read this year. And I guess with that I should adjourn this meeting of the Barbara Britton Fan Club and get back to work. Barbara Britton and Richard Denning from "Mr. and Mrs. North"
A trade paperback called ERNEST HEMINGWAY: A LITERARY REFERENCE, which seems to be a year-by-year overview of Hemingway's work, including letters between him and Maxwell Perkins, assorted reviews, photocopies of manuscript pages, etc. I'm a big Hemingway fan, so I'll browse through this one happily, I'm sure. The movie tie-in edition of Daniel Woodrell's Civil War novel WOE TO LIVE ON, under the movie title of RIDE WITH THE DEVIL. I never saw the movie, and I've only read one Woodrell novel, TOMATO RED, which I thought was okay but not something that was going to make me a big fan of his work. I liked it well enough to give this one a try, though. Ace Double F-285, SHIPS TO THE STARS by Fritz Leiber and THE MILLION YEAR HUNT by Kenneth Bulmer. The Leiber is a short story collection. The only thing I've read by Bulmer was a Viking novel under a pseudonym, but it was pretty good. NAKED IN A CACTUS GARDEN by Jesse Lasky Jr., a Hollywood novel I'd never heard of, but I generally like trashy Hollywood novels. Not a great haul, but I'll take it. I watched one of the Flash Gordon episodes on DVD, and while it was pretty cheap and hokey, I enjoyed it. Steve Hollard sports an odd hair style in this series, but for a non-actor he's pretty good, and so are the action scenes. 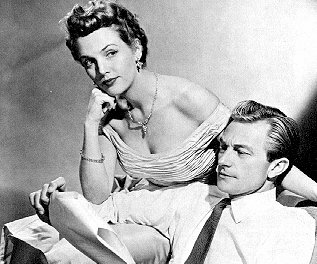 Bill Crider has been talking about the Mr. and Mrs. North TV series starring Richard Denning and Barbara Britton (check out the photo of Ms. Britton on Bill's blog, if you haven't seen it already). I haven't seen any of the TV episodes, but years ago I read nearly all of the Mr. and Mrs. North novels by Francis and Richard Lockridge and really enjoyed them. I also read their series about a police detective named Heimrich, I think. Richard Lockridge continued writing after his wife's death, but the books weren't nearly as good, leading me to suspect that she plotted most of them. Anyway, I think that tonight I'll watch one of the Flash Gordon episodes. Flash was played on TV by Steve Holland, who is perhaps best known as the model for the Doc Savage covers that James Bama painted for the Bantam reprints. 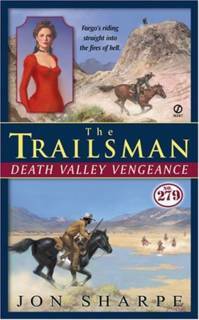 However, he was a cover model for lots of paperbacks, including some of the Louis L'Amour novels and the Nevada Jim series. I associate Holland almost as much with Western paperbacks as I do with Doc Savage. Like Bill Crider, I'm addicted to the cheap DVDs at Dollar Tree and Wal-Mart. One that I picked up a while back at Dollar Tree has three episodes of the old TV series SERGEANT PRESTON OF THE YUKON on it. Since the book I'm writing has a Mountie in it, I thought it would be appropriate to watch an episode of SERGEANT PRESTON. Call it research. Yeah, that's it, research. Hard to believe that in 170 books this is the first one to feature a Mountie, but as far as I can remember that's the case. Anyway, I was surprised to find that the show was in color. Not very good color, mind you, but still . . . The story was set in a ghost town, and as anyone who has ever watched a B-movie or read a pulp story knows, the buildings in ghost towns are always full of hidden passages and secret hideouts. This episode was no disappointment. Sergeant Preston got to the bottom of the mystery and caught the villains, with the help of his wonder dog, Yukon King. I enjoyed every minute of it. Less enjoyable has been the weather around here. We haven't seen the sun for about a week now, and I'm tired of the constant gloom and drizzle. I honestly think it's slowed down my production. With the rain not supposed to break until the weekend, I think I'm going to take an extra lamp out to my studio in an attempt to brighten it up some. I hope that helps. It occurred to me that I ought to post some covers every now and then. 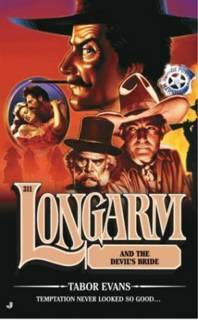 Here are two, one that's out now (Longarm) and one that will be out in January (Trailsman). 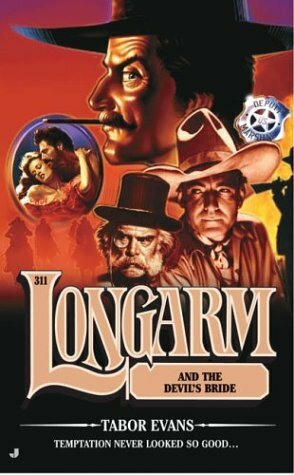 I don't know what Buck Jones is doing on the cover of that Longarm, but hey, it's always good to see ol' Buck. Made stops at two libraries today, as well as Half Price Books and Wal-Mart. I picked up a few research books for that new idea I'm working on, but at this point it's just background. I have no idea when I'd have time to write even chapters-and-outline for the book. But maybe I can get a basic plot written down so I won't forget it later. I didn't buy much at Half Price: a couple of Leslie Ford mysteries (I haven't read the Fords I bought a while back, so I still don't know if I'll like them or not, but what the hey, they were only a buck apiece), and also for a dollar, a copy of ROGUE ROMAN by Lance Horner (a plantation novel transplanted to ancient Rome) to replace a copy I had that seems to have gone missing. Once we got back I was able to work for a while, got the revisions done I wanted to do on the current book and also wrote a few more pages. There were page proofs of a Trailsman novel waiting on the doorstep when we got home, so I'll be taking the time to read them in the next few days, too. This was just another chilly, rainy work day, semi-productive, not great. But I did come to a fairly important decision, I think. When I started this book I thought I would change my style a little on it, just to keep things interesting. That's one of the advantages of writing house-name books: as long as you stay reasonably close to the established formula, you can do all sorts of playing around with style and characters. Anyway, fifty pages into this one in my "new" style, I hate it, and it's taking me longer than usual, and I'm smart enough to call a halt to this failed experiment. I'm going to go back and revise that first fifty pages into my regular style and write the rest of it the way I normally would have. It's always good to try new things, but you've got to be able to recognize when they're not working. I spent yesterday going to Brownwood, Texas, about 120 miles southwest of where I live, for the funeral of one of my aunts, who passed away on Wednesday. My mother went with me, and we visited a little with other relatives while we were down there. (Both my mother and my father were born and raised down in that area, and I still have lots of relatives around there.) The driving pretty much wore me out. Time was I could drive all day and not feel it much, but that's no longer the case. When I was a kid I always liked going to the house of the aunt who passed away this week, Iva Mae Heath. She had a nice back yard where her husband Bear liked to grill hamburgers (every kid should have an uncle named Bear). My cousins knew somebody who worked for the local magazine distributor, so they had stacks and stacks of stripped comic books. (In those days, unlike paperback books, only the top third of a comic book cover was torn off to return for credit.) And they had a color TV, too, which was magical to me. We didn't get a color TV until 1966. My aunt was a big fan of Western TV shows, especially BONANZA. I've never forgotten one time when she said that she watched an entire episode of BONANZA wondering where Adam was, before she finally realized that she was actually watching THE VIRGINIAN. Today I got back to work on the current book and had a pretty productive day. I only have about half an outline on this one, so I hope I don't run into a brick wall part of the way through. That hardly ever happens, but I always worry about it. Winter-type weather has arrived at last in this part of Texas, cold and dreary. I turned on the heater in my studio today for the first time since last winter. I don't know when the name was officially changed, but I definitely remember hearing November 11 being referred to as Armistice Day when I was a kid. Whatever you call it, thanks to all the veterans, past and present, who help keep us safe and free. I never got around to working today, too much real life going on. I got my new book started today and as usual really enjoyed getting those first few pages done. New books are always full of promise. It takes a few days before the amount of work they represent really soaks in on my brain. I put that troublesome outline aside, but Livia and I talked about it some more today, while I wasn't working on the new book, and I think we're on the right track with it and can wrap it up in a day or so. Always got something going on in the ol' brain. I'm reading books for the Spur Awards again. Quite a few submissions have come in during the past week or so, and I have to keep up with them or get swamped. I've now watched a couple of those Superman cartoons produced in the Forties by Max Fleischer. The animation is very good, simple but effective and capable of producing some striking images. But boy, the plots are sure thin, even by Forties cartoon standards. I was also surprised that they monkeyed with the origin story, having Kal-El raised in an orphanage rather than being found by Ma and Pa Kent. But then I got to thinking that maybe at the time these cartoons were produced, Ma and Pa Kent and that whole backstory hadn't been introduced yet in the comic books. For some reason I have the impression that they first showed up in the late Forties. Somewhere I have various comic book history volumes that would answer that question, but I'm too lazy to dig them out. I had planned to start the next book today, but instead I wound up doing some revisions on a previous book that the editor asked for, as well as grappling with a balky outline that still isn't finished. I think I'm going to have to put it aside and let it percolate in my brain for a while. Sometimes when a plot won't work out all I really need to do is get away from it for a few days, and then when I go back the answer seems obvious. Yesterday I sat around and worked on outlines for series Westerns I'll be writing in the coming months. Today was what we laughingly refer to as "a day off", which means we went to the library, a bunch of stores, and finished things off by buying groceries. Along the way, though, we worked on the plot for a mystery novel proposal that Livia is putting together. An awful lot of our books have been plotted that way, in the car while we're running around taking care of errands. I also picked up a couple of DVDs of old Superman cartoons made in the Forties by Max Fleischer. Bill Crider talked about these on his blog a while back. I haven't seen any of these cartoons in years, but they have a good reputation among fans and I plan to watch at least one episode tonight. I went through that Silverberg anthology and read all the story introductions. That may not be the best way to approach an anthology, but that's usually what I do. In this case, the intros form a sort of literary autobiography, although an incomplete one since they concentrate on Silverberg's SF and barely mention his work in other fields. (There's no mention at all of his Westerns.) Interesting stuff, though. I really don't have time to read the stories, since I've got to get back to reading books for the Spur Awards, but I'll probably dip into it again a few times before I have to give it back to Shayna. This weekend is being devoted to working on proposals and outlines, sort of the yard work of the writing business. And it can be fun on occasion, too. Today was pretty productive, and I enjoyed it for the most part. Tonight we watched the DVD of THE BIG BOUNCE, which makes three remakes in a row for us. I wasn't very impressed with this one. Good dialogue and an attractive cast, but the story really meandered around. I haven't read the Elmore Leonard novel or seen the first movie version, so I can't say how this one compares with it. I'm still reading that Nebel novella; not much time today to read. My daughter Shayna brought home PHASES OF THE MOON, the big "retrospective of six decades" anthology by Robert Silverberg, and I think I'll probably swipe it from her even though there are other things I need to be reading. I've never considered myself a big Silverberg fan; on the other hand, I've never read anything by him that I didn't like. This book has lots of story introductions and memoir-type stuff, and I eat all that up with a spoon. I spent most of the day doing yard work, stuff I had let slide while trying to finish the last book. Had to bust up a lot of old boards. We tried to burn some of them but had little luck with that so we wound up bagging up most of them for the garbage. Then did a bunch of mowing. Nothing like manual labor to make you appreciate writing. I'll probably get back to that this weekend. I finished DEAD MAN'S DANCE by Robert Ferrigno. Took me a while to get into this one, but once I did I enjoyed it very much. Nice tight writing, nice twisty plot. I'll definitely read more by Ferrigno. I'm currently reading EAST OF SINGAPORE by Frederick Nebel, a chapbook reprint of a novella from the July 1926 issue of ACTION STORIES. I've read quite a few of Nebel's hardboiled private eye stories from BLACK MASK and DIME DETECTIVE and enjoyed all of them. This one is a bit different, a South Seas adventure yarn, but a lot of fun so far. Over the past couple of days we watched the DVDs of a couple of remakes: WALKING TALL with the Rock and AROUND THE WORLD IN 80 DAYS with Jackie Chan. Both of these movies got bad reviews when they came out, if I remember right, but I enjoyed them quite a bit. I like the Rock, thought THE SCORPION KING and THE RUNDOWN were both very good. WALKING TALL isn't quite as good but still fun. Johnny Knoxville makes a good sidekick. I also like Jackie Chan and thought this movie was really colorful and entertaining. It was silly, even a little dumb at times, but that's okay. And I enjoyed all the cameo appearances. I think I would have really liked this one if I'd seen it as a kid. I remember watching a probably equally unfaithful movie version of Verne's FIVE WEEKS IN A BALLOON and liking it a lot. Also THE MYSTERIOUS ISLAND, which is a sort-of sequel to TWENTY THOUSAND LEAGUES UNDER THE SEA. Good adventure movies in those days, although I don't know how well they'd hold up if I saw them again now. Terrill Lankford sent along some nice words commenting on my previous post about finishing my latest book, and I certainly appreciate them. But you went and made me think about what it's like writing lots of books, so this ramble is on your head, Terrill. I didn't set out to be prolific. I just wanted to write books that I enjoyed writing and make enough money at it to keep from having to go out and get a real job. Early on, though, I was lucky enough to start writing Mike Shayne novellas for MIKE SHAYNE MYSTERY MAGAZINE as one of a rotating group of authors writing as Brett Halliday, and then after a while the editor, Charles E. Fritch, asked me to do all of them. This meant coming up with 20,000 words each and every month. I discovered I had a pretty good work ethic, and I liked the regular check. (This was when MSMM still paid regularly, a situation that, sadly, did not last.) When I started selling novels, I drifted into series work because that was where the most opportunities were at that time. I liked writing the books and I got them done on time and in good enough shape that they didn't need a lot of revision, which meant that the editors liked working with me. They threw me more and more jobs, and I turned down very few of them (and still regret the ones I did turn down). Over the years I've learned that there are a lot of writers who write better than I do, and there are a lot of writers who write faster than I do, so the key for me is to keep combining speed and quality to the best of my ability. Someone once said that writing series books is like hitting a baseball: sometimes you swing and miss, sometimes you get good wood on the ball but hit it right at somebody, sometimes you hit a single or a double or even a home run. But you take your swings as best you can, then get back up to the plate next time and do it again. I've also had a huge advantage in being married to an excellent plotter and editor. I can say to Livia, "I need a Longarm plot," and usually within a day or so she'll give me one. Or I'll do something incredibly stupid in a manuscript and she'll spot it and either fix it herself or tell me what it needs. So the editors never see those mistakes and probably think I'm smarter than I really am. Some books I plot myself and Livia doesn't find anything that needs fixed except a few typos. But without her help on the others I'd never be able to keep up the pace that I do. I finally wrapped up the current manuscript today. I still have a little editing and polishing to do on it, and Livia may have some revisions to suggest before she's finished going through it, but from a creative standpoint, anyway, it's finished. As I've probably mentioned before, I love finishing books. I also love starting books. It's all that stuff in between that wears me out. This is my 169th novel (not counting a couple of trunk books that never sold). When I started in this business, I figured 100 books would be a good total for a career. I've been revising that goal upward for quite a while. Now I think I'm looking at 300 or so, if I'm lucky and can keep getting contracts. Sounds like a lot, but I know plenty of writers who have done more. Some of them, a lot more. I also know a guy who once said that no writer could ever write more than seven good books. In that case, I was either washed up a long time ago . . . or I just haven't written my seven good ones yet. Still reading the Ferrigno book. Twenty years ago today, our oldest daughter Shayna was born. It's very hard to believe that it's been that long. Certainly doesn't seem like it. When she was little, we called her a joy and a treasure, and she truly was. Over the years she's grown up into a complex, interesting, and beautiful young woman. We love her a whole bunch. So happy birthday, Shayna, if you're reading this. On the writing front, I had another pretty productive day but still didn't finish the blasted book, which continues to grow like Topsy. It's going to wind up longer than it has to be (it already is, actually), but the editor likes for the books to be a little long. I should finish it tomorrow. I'm reading DEAD MAN'S DANCE by Robert Ferrigno. I'd never read anything by Ferrigno before, and while the book is okay so far I have the nagging feeling there's something I don't like about it. It's certainly good enough to finish, though, so we'll see. Oh, yeah, there was an election today, too . . . or something . . . The past couple of days have been spent mostly in front of the computer, trying to get to the end of the current book (which refuses to go quietly into that good night). I did make a library and Half Price Books run today, but more on that later. Since we live out in the country, we never get trick or treaters on Halloween, so I usually don't get much sense of that particular holiday having come and gone. My one Halloween tradition is to watch IT'S THE GREAT PUMPKIN, CHARLIE BROWN. I recorded it last week when it was on TV and watched it over the weekend. Since it came out in 1966, I think there were a couple of years when it didn't run on TV, and one year I completely forgot about it, so this was probably my 35th time to watch it. And I still enjoyed it. "I got a rock" is still funny. And I've always enjoyed the Snoopy vs. the Red Baron bit. One minor annoyance is that it hardly ever runs in its complete form. For years CBS cut the "I got a rock" bit, and now ABC cuts short Lucy's dog lips rant. Great music, funny stuff, and quite touching in places. A classic, in my opinion. Some people seem to think this was the second Charlie Brown cartoon, after A CHARLIE BROWN CHRISTMAS, but it's actually the third. The second one was the not-seen-for-years baseball-themed cartoon. It's been so long I'm not sure of the title. CHARLIE BROWN'S ALL-STARS, maybe? One of the regular plots in Gold Medal novels was that of the regular joe who winds up being blamed for a murder he didn’t commit, so that he has to discover the identity of the real killer in order to save his own skin. This plot sort of crops up again in Domenic Stansberry’s new novel from Hardcase Crime, THE CONFESSION, which is a clever, very well-written, and very dark updating of the sort of psychological thriller that used to be written by Dorothy B. Hughes and Margaret Millar, among others. Jake Danser may have a regular joe sort of name, but he’s far from that. A forensic psychologist, he’s married to a beautiful, wealthy woman, but he also has a mistress on the side. The mistress winds up dead, and the clues not only point to Jake as being the killer but the investigation also turns up evidence possibly linking him to a whole string of similar murders. This novel is positively crowded with clues. The trick isn’t spotting them; it’s figuring out what to make of them. Stansberry also does a masterful job of playing with the reader’s sympathies. The first person narration makes us want to believe that Jake is really innocent. After all, he’s letting us into his head and telling us his story, so he can’t really be that bad a guy, now can he? Well, maybe . . . and maybe not. Good stuff all around. This is the first book I’ve read from Hardcase Crime, but it certainly won’t be the last. Pretty slim pickings at Half Price Books today. I picked up three issues of the old Warren black-and-white horror magazine, CREEPY. This was always my least favorite of Warren's horror titles, but I still buy them when I run across them these days.